"Glitter, glitter, and more glitter! That’s what the days after experiencing Sydney’s Gay and Lesbian Mardi Gras were like – finding it in places you’d never think were possible." I remember my first day at SBS orientation so well. 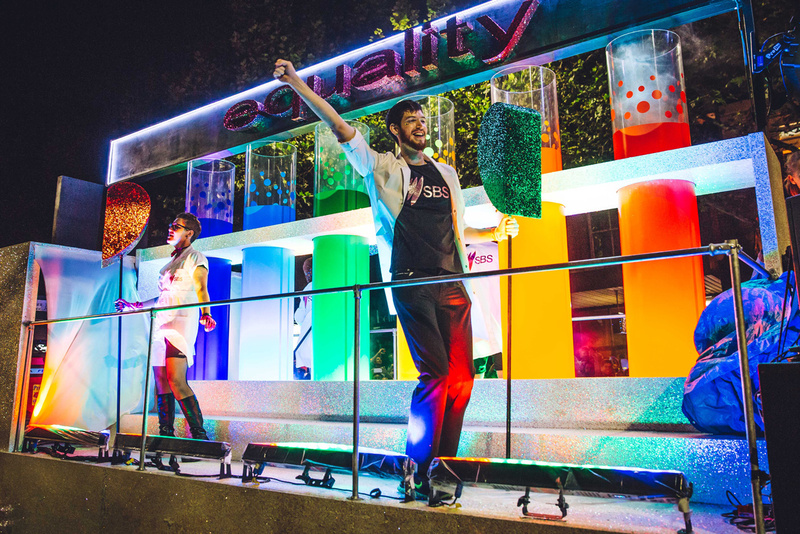 An energetic marketing manager came into the room giving a spectacular overview of the brand and some of our major events throughout the year, including the pinnacle event in the LGBTQI calendar: Sydney’s Gay and Lesbian Mardi Gras. Right away she encouraged everyone in the room to sign up and be part of the glittery parade. I was sold. I knew my 11 years of jazz and tap would pay off for this moment, even though dancing experience wasn’t required. Flash forward months after settling into my new role at SBS, the Mardi Gras parade attendee call-out finally happened. 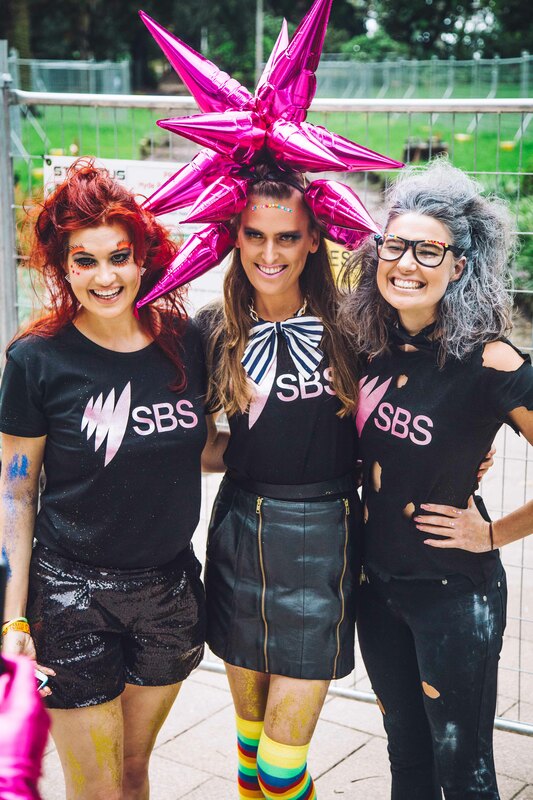 ‘We need you’, said the email from an SBS Mardi Gras account. I remembered back to my very first day and what that marketing person told me, applied, and believe it or not, I was in! 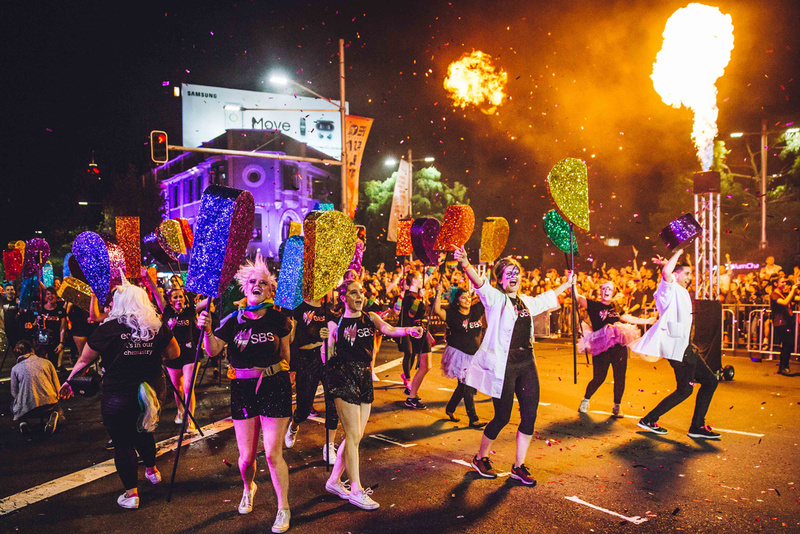 The Sydney Gay and Lesbian Mardi Gras is one of the world’s largest, most high profile and most loved LGBTQI celebrations, and provides an opportunity to commemorate a universal message of diversity, equal rights, pride and inclusion, and I felt privileged to be part of it.
" Proudly wearing my SBS shirt in the marshalling area, a woman randomly came up to me and said, “If I was wearing your shirt right now, I would be really proud. Well done SBS." All up we spent a month of hour-long sessions learning our dance routine in one of our studios on site. I was pretty impressed that we had learnt over half of the routine in the first session, which meant that by the final one, we were ready for the real thing. I was also really impressed with the enthusiasm of one of our lead choreographers and marketing colleague who taught us the moves. This year’s theme was ‘Equality’, and SBS drew on a scientific interpretation with ‘Equality – It’s in our chemistry’. It explored how love is all about chemistry, regardless of race, gender, age or sexual orientation. It was amazing seeing everyone in costume, full of personal flair, colour and glitz alongside our scientists who were lucky enough to dance on the float. 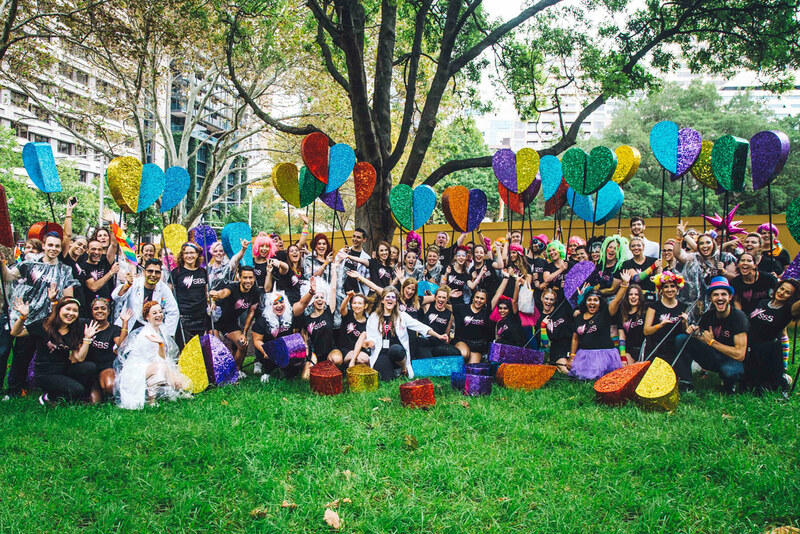 Glowing rainbow test tubes and glittery love hearts were our thing, and dancing along to ‘Chain Reaction’ by Diana Ross was a perfect mix, as when we met our dance partners, our half-heart props came together to create one big, glittery heart. This was an incredible experience that will live with me forever. The marshalling area was phenomenal in its catastrophic glory. 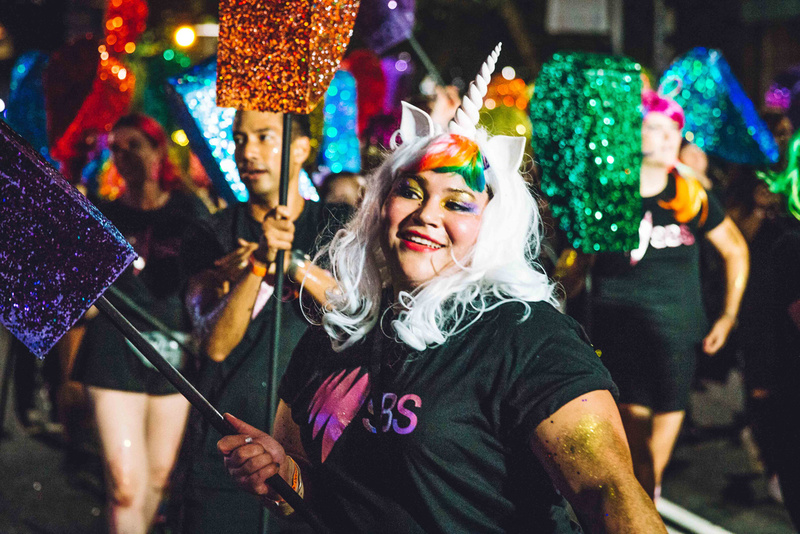 I had never seen so many feathers, rainbows, make-up kits or glitter before in my life, and the whole area resonated with incredibly positive vibes. Naturally, dress-ups were necessary. A unicorn with a hint of rainbow was my chosen style.
" Glitter, glitter, and more glitter! That’s what the days after experiencing Sydney’s Gay and Lesbian Mardi Gras were like – finding it in places you’d never think were possible."